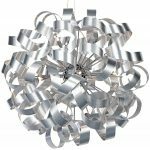 This Dar Rawley large modern 12 light ribbon pendant ceiling light is contemporary and features a polished chrome frame with masses of contrasting brushed aluminium finish ribbons forming a globe. Polished chrome ceiling mount, wire suspension and clear encased flex, with a polished chrome sphere and radiating spokes. 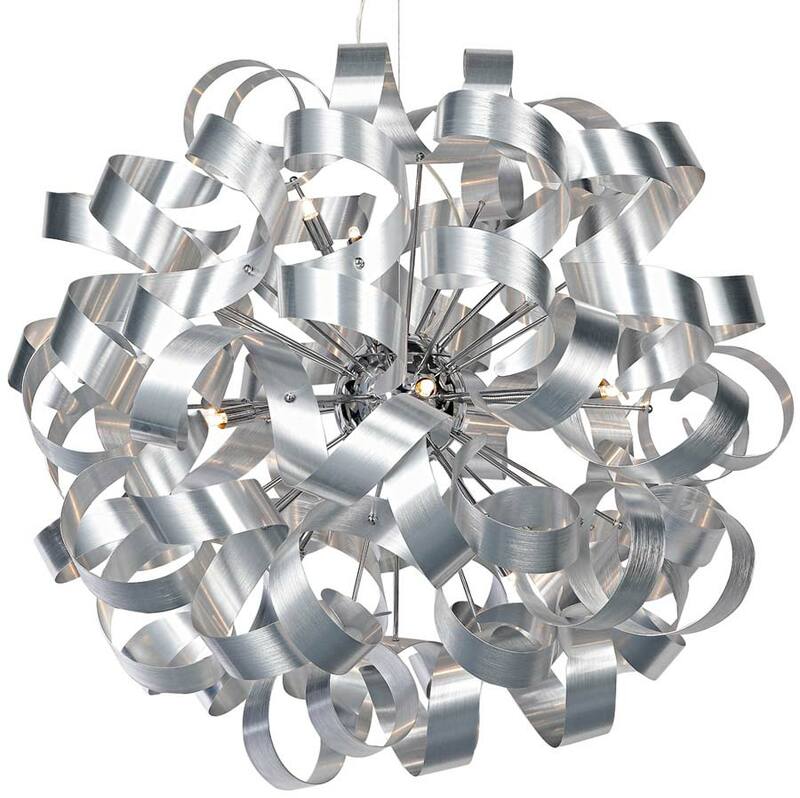 Every spoke supports a twisted brushed aluminium ribbon which form a large 80cm sphere. The light from the twelve lamps will reflect from the polished chrome inner globe through the ribbons to create lovely shadows and wonderful light. The clever contrast between bright chrome and brushed aluminium gives this fitting a modern feel that will ensure it makes a bold statement in any contemporary space. A beautiful on trend design that will instantly modernise your room. This is a large pendant and will require a good sized room to be shown at its best. 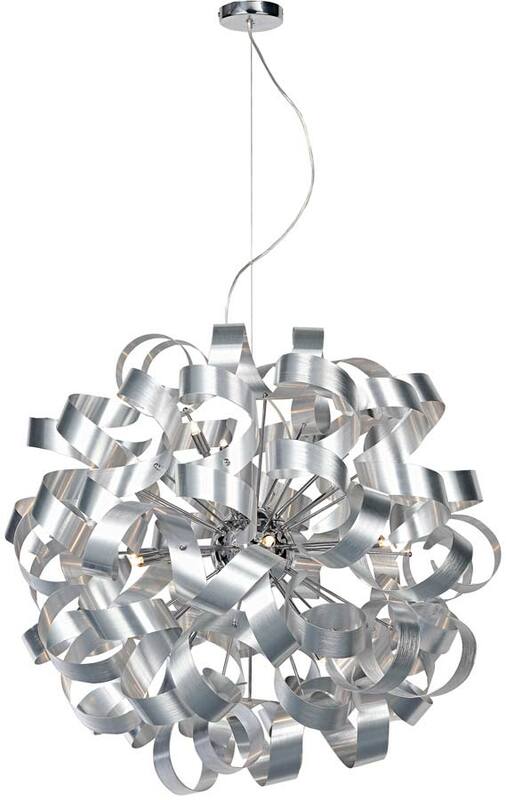 Particularly suited for installation over a dining table, in a living room, bedroom, modern kitchen or hallway. There are co-ordinating fittings available in the brushed aluminium Rawley range that can be viewed below and include a 9 light pendant, 4 and 5 light flush ceiling lights and a wall light. Also available in brushed copper and polished chrome finishes. 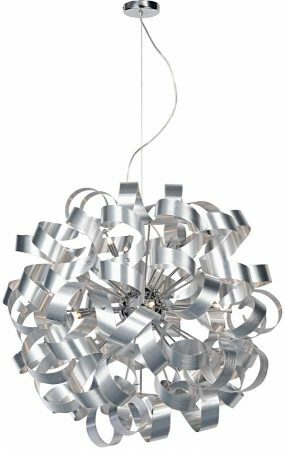 Dar lighting is widely recognised as one of the leading suppliers of a full range of innovative, quality lighting products such as the Dar Rawley 12 light brushed aluminium ribbon pendant featured here.